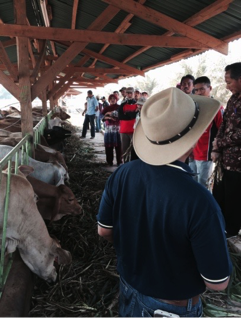 Creating shared value : Indonesian beef producer innovation. A few months ago I visited Great Giant Livestock (GGL) which fattens, breeds and milks in the order of 20,000 cattle (mostly Australian) within the pineapple plantation where it utilizes much of the waste of the manufacturing processes at the same time as generating highly valued fertilizer to recycle back to the plantation. GGL is a subsidiary of the Great Giant Pineapple Company which, as the name suggests, is Indonesia’s (and the world’s) largest single location plantation and manufacturing facility. From this 32,000 hectare site in southern Sumatera, it processes more than 500,000 tons of pineapples and exports 11,000 containers of canned pineapples around the world annually. Large Indonesian companies are required by law to establish Corporate Social Responsibility (CSR) projects designed to benefit their local communities. I have seen many examples of these and in the majority of cases they are confined to relatively simple handouts that allow the company to tick the auditor’s box. Believe it or not, it is actually extremely difficult to “give” to the community without creating new social stresses despite the very best intentions. I have seen several extremely well meaning and generous community projects turn sour because the level of complexity of the relationships within the social structure of the traditional village can very easily result in conflict and dissatisfaction from some quarters regardless of the genuine efforts and financial resources expended to make the project a success. When live animals are involved, the degree of difficulty for designing a sustainable village social project increases by the power of 10. GGL has approached this challenge from a different perspective than most big companies with a concept they have named Creating Shared Value (CSV). Through CSV, GGL aims to establish sustainable business opportunities that benefit the farmers, their communities and the company. With this ambitious theme in mind, the GGL team, led by the dynamic Dayu Ariasintawati, have developed a range of carefully structured joint venture opportunities for local farmers to allow virtually anyone who is committed and interested to participate in a program of cattle rearing with the capacity to benefit both the small farmer and GGL. Central Lampung has been a large cattle breeding centre in the past but the traditional smallholder production systems have become less attractive over the last decade or so with a large proportion of farmers selling their cattle and switching to alternative enterprises. Through the CSV, GGL is demonstrating that there are profitable models that allow farmers to get back into cattle production with a strong and reliable partner to support them through mentoring, training and integration options. The various business models that GGL have developed didn’t just appear overnight but have been continually reviewed, modified and refined over several years to ensure that they fit the needs of all of the stakeholders. This has involved intensive and ongoing development through in-depth training of farmers in a wide range of subjects from economics, animal health and welfare and the management of natural resources. One of the major benefits of GGL’s involvement is the capacity to provide farmers with Australian breeders with their much greater capacity to produce beef compared with local cattle. 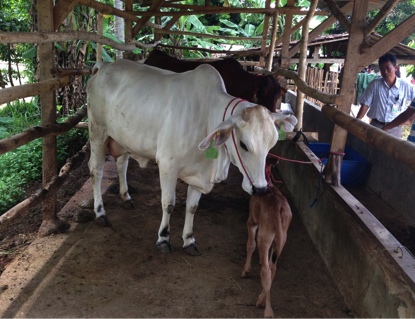 An Australian born Brahman X cow with her new calf in central Lampung. The outcomes are impressive with new farmers lining up to join the program. In one village that I visited, one of the farmers proudly showed us a new piece of land he had been able to purchase as a result of his recent cattle sales. He was so proud, he couldn’t get the smile off his face. At the same time GGL has been able to expand its “herd” of breeders, feeders and fatteners without the need for additional infrastructure and intensive management resources back on the plantation. All of the smallholder facilities comply with ESCAS requirements. Dayu (lady in the front row) with a group of farmers from the Karang Endah village during one of their many training, mentoring and discussion sessions. The huge number of small farmers in the surrounding district represent a wide range of income levels, land ownership status (including some without land), access to finance and business savvy. This variety of potential partners has forced the development of a number of different business structures to take account of these factors. 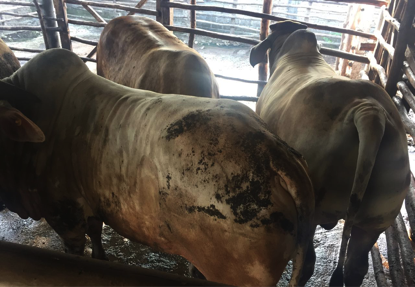 Animal husbandry staff are provided by GGL to monitor performance and provide veterinary and technical support such as artificial insemination as required. The farmers provide their cattle pens, labour and additional forage (grass, corn, crop wastes, green chop). One of the critical keys to success of these village systems is the supply of pineapple waste and concentrate (including other waste products and a vitamin and mineral mix designed by GGL specialists to ensure a balanced ration) which allows the farmer to reduce the amount of grass/corn or green chop he needs to personally cut every day. In the traditional village system the time available for this activity limits the volume that can be cut and therefore the number of animals that can be fed. The supply of waste and concentrate from GGL allows the farmer to reduce his green chop cutting requirements to around 2 kg per head per day. This immediately allows him to feed 10 cattle while still personally cutting the same volume of forage that previously fed only two head. The farmers also have the option to sell their cattle manure back to GGL. 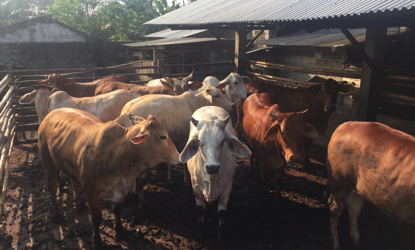 Since the program commenced in 2014 a total of about 5,000 head of cattle have been distributed to 300 farmers in 8 districts across Central Lampung. In most cases the farmers are organized into cooperatives with between 40 and 80 farmers in each coop. Heifers being fattened in a smallholder back yard pen. Some farmers share the same pen. I initially assumed that the success of this project was driven by the fact that GGL could afford to provide the farmers with their food processing wastes at no cost, but this could not be further from the truth. Operating the projects on a commercial basis is in fact what has made these models a success because there are no “free handouts” so everyone in the system needs to play their part in order to achieve a successful outcome. This is where the power of Dayu’s vision and drive has been the key to success. It was her conviction that these models would not prosper if they were structured around company give-aways. Each party has their responsibilities and both must perform in order to achieve collective success. Therefore the models have to be extremely well designed in order to allow both sides to achieve a real commercial return while still meeting their production objectives. In the early days this meant making changes to the models when both players agreed that some aspect was not working. The good will generated by this frequent review and renegotiation process has allowed everyone to feel real ownership and confidence in the collective fairness of the enterprise. Steers being fattened for slaughter in the farmer’s pen. Farmers can now confidently join the project knowing that they can select a model that will allow them to contribute to the extent that their personal resources will allow. The rewards may not be large but they are enough to encourage most farmers to participate in the next cycle and, if possible, to keep expanding their venture to the next level of production and return. Farmer training in best practice cattle care delivered by Din Satriawan from GGL. One very positive but unintended outcome has been the change in attitude of the banks to providing finance to small farmers for cattle purchases. Until the GGL project had proved that its various models were commercially viable businesses, banks would not even consider using cattle as security against borrowed funds. Now that GGL has established its range of alternative investment options with a proven track record of safe returns, the banks are actively offering farmers finance to purchase livestock with potential for those stock to act as the security for the loan. Recent Indonesian government policies to support the local beef industry have been largely unsuccessful. The new government subsidized live cattle insurance policy however has been a real winner. For the very first time, farmers are able to insure their cow at a very cheap, subsidized rate and dramatically reduce the financial risk of the loss of the cow. Without the benefit of insurance, the death of the cow was a devastating loss to the family. This policy has also provided the banks with additional comfort in terms of their loans with livestock as their security. Creating successful Corporate Social Responsibility projects where the company just “gives” to their community is not as easy as it sounds. Creating Shared Value projects, where everyone benefits, including the company, is getting close to impossible. The successful GGL model with multiple livestock options to allow full participation at all levels within the community is simply miraculous and is only possible through the passion, leadership, intellect and relentless drive of Dayu backed up by the full support of the company. If such a system could be replicated several hundred times across the archipelago then the shortage of locally produced beef would soon be overcome. Unfortunately for Indonesia, there is only one Dayu. Beef Investment Opportunity – under an equatorial palm tree. A welcome turn around from the ‘pure greed’ displayed in the late nineties.